A spectacular villa offering idyllic tropical living at a highly desirable beachfront location within easy reach of Koh Samui’s main attractions. Amenities cinema room, TV/DVD in master bedroom, sound systems throughout, WiFi internet, air-con bedrooms, fully-equipped kitchen, BBQ, indoor and outdoor Jacuzzis, access to shared gym and sea kayaks. Sangsuri Villa 3 is a fabulous beachfront property located on a secluded cove in north Chaweng, with sunrise sea views and within easy reach of the island’s main attractions. Designed in contemporary tropical style, with thatched roofs, cool white terrazzo floors, and foldaway glass walls, Sangsuri Villa 3 is set within beautifully landscaped gardens that feature grass lawns, reflection ponds, and numerous mature trees. 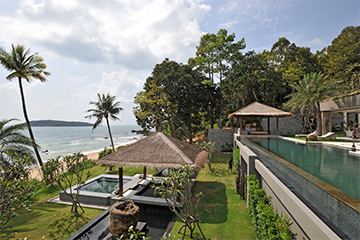 Accommodating parties of up to ten guests in five luxurious en-suite sea-view bedrooms, Sangsuri Villa 3 is finished and accessorized to the highest standards, with state-of-the-art entertainment system and appliances. Private gated driveway access on two sides of the property lead to a covered car port on the top level, from where stairs descend to the upper terrace. An expansive grass lawn runs across the width of the upper terrace, encompassing towering trees and reflection pools showcasing immense sculptural stones. On either side of the wide stairway that leads down to the middle level of the villa, are mirrored bedroom suites, each with slide-away glass walls on three faces, and surrounded by reflection pools leading to large private decks with built-in day-beds. Both bedroom suites have vaulted ceilings, King-size beds, sumptuous armchairs, and large mirrors over the beds. One bathroom includes a free-standing al-fresco tub in addition to the internal terrazzo bathroom with walk-in rain shower, while the other bedroom has an al-fresco shower to compliment the internal bathroom. At the far side of the upper terrace is a third guest bedroom with Queen-size bed, vaulted ceiling, a private deck, and en-suite bathroom with walk-in rain shower. All of the bedrooms at Sangsuri Villa 3 are air-conditioned, with ceiling fans, blinds, built-in wardrobes, and safes. At the rear of the property is a garage, with staff quarters above. Set behind a high wall is a parking forecourt and a well-equipped air-conditioned gym. The gym is fitted with Life-Fitness equipment, and is shared with the adjacent Sangsuri Villa 2. This building also contains a dorm, with 6 bunk beds and 2 pull-out beds, sleeping 2 adults or up to 8 children. The stairway to the main living level leads to a central terrace and a long reflection pond with fountains and palm trees. On either side of the open terrace are covered walkways shaded by wooden louver screens. At the front of the living area, a grass lawn borders the infinity edge swimming pool, and runs the width of the property, with mature palms and frangipani trees casting shade and fragrance. The lounge and dining room feature foldaway glass walls that maximize the premise of indoor-outdoor living, capitalizing on the fresh sea breezes. The lounge, living room, and cinema all include electronic blinds, built-in storage, ceiling fans, and state-of-the art speakers connected to the media system. At the far end of the swimming pool is the master bedroom while at the other end of the pool is a large sala pavilion lounge. The air-conditioned cinema room has sumptuous white sofas, and includes an en-suite bathroom. Both the cinema screen and projector are electronically lowered from the ceiling, and otherwise remain concealed. In addition to satellite TV and DVD, the cinema is connected to a media system that contains a vast digital library of movies and music. The music selection is accessible from various zones around the villa, via individually controlled speaker clusters. Plush white sofas are arranged around a coffee table in the lounge, while the opposing dining room has a long dining table seating ten, and a breakfast island with bar stools. Behind the dining room is a gourmet kitchen with a range, oven, two fridge-freezers, ice machines, and espresso machine. The lavish master bedroom features a large LCD TV that is concealed in the ceiling, and can be electronically lowered. Slide-away glass walls open onto the pool on one side, the lawn to the rear, and a large private deck to the front. The bedroom has two large armchairs, a dressing room, and spectacular views. Large lounge chairs and a sofa bench complete the deck. The en-suite bathroom includes a walk-in rain shower, and a semi al-fresco free-standing Jacuzzi tub. The poolside sala pavilion comprises sofas arranged around a huge coffee table, and is the ideal spot to lounge around the pool, and enjoy the sea views. The swimming pool is flanked by sun-loungers, and tiled in Javanese aquamarine stone. Built-in steps lead down into the centre of the 20 metre infinity-edge swimming pool, which has a shallow end next to the master bedroom. Stairs lead down from either end of the middle level to the lower terrace, with a large grass lawn and an array of mature trees and shrubs, as well as reflection pools with sculptural stone artifacts. In the middle of the lower terrace is a second sala pavilion with built-in sofa bench seating. The sala is a great party spot, with outdoor speakers connected to the media system. Adjacent to the sala is a huge Jacuzzi tiled in mosaic, with infinity edges on three sides. At the far end of the lower terrace is the fifth bedroom, which opens onto a covered deck. An internal stairway connects the master bedroom to the lower bedroom. The scenic golden sand beach is accessed via a wooden stairway, and is secluded and quiet. Sangsuri Villa 3 is a spectacular property offering absolute luxury and privacy at a highly desirable beachfront location within easy reach of Koh Samui’s main attractions. The epitome of tropical chic, Sangsuri Villa 3 combines the elements of fantasy, understated opulence, and decadent comfort within a stunning tapestry of landscaped grounds and shimmering sea views. The easterly perspective is open to the prevailing northeasterly winds, with fresh sea breezes flowing through the villa at most times of the year. A five star resort is located a short walk away from Sangsuri Villa 3, and offers a convenient restaurant and spa, while myriad additional restaurants, spas, bars, and shops can be found within 5 minutes drive, with Choeng Mon to the north, and Chaweng town to the south. Complimentary WiFi broadband internet is available throughout Sangsuri Villa 3. The dedicated Thai chef is available to cater for all meals, and can prepare a limited range of Western dishes in addition to great seafood BBQs and delicious local cuisine. Sangsuri Villa 2 is located between Choeng Mon and Chaweng beach on a secluded beach, minutes away from a wide range of restaurants, shops, spas, and bars. 5 minutes drive from downtown Chaweng to the south and Choeng Mon to the north, 7 minutes from the airport, 15 minutes from Bophut Fisherman’s Village, and 30 minutes drive away from the Santiburi Golf and Country Club. A 6000 sqm lush garden with 8 treatment pavillions offers massage, meditation, yoga, and pilates, exclusively to guests at Sangsuri. Rates are for exclusive use of the property, with base rates for 2 bedroom occupancy for up to 4 guests. Each additional bedroom is charged at a daily rate of $100++ USD for up to 2 guests. A dorm is available, accommodating up to 8 children, or 6 adults, at a daily charge of $200++ USD. -Additional airport transfers are charged at $25+ USD per trip, and subject to 7% tax. -Minimum stay of 3 nights in standard season, 5 nights during CNY, Easter, July and August, and minimum of 7 nights over Xmas or NY, or 10 nights over Xmas and NY. Airport transfers, one trip each way. Welcome lunch or dinner with 2 bottles of wine. Farewell beach front movie night with 2 bottles of sparkling wine. 10% discount for stays in March. Applicable to all ocupancy rates, and cannot be used in conjunction with other promotions. Not applicable to Xmas/NY, Chinese NY, or Easter, and cannot be combined with other promotions. 5% discount for booking made 120 days or more in advance. Applicable to new bookings, at full occupancy rates, and cannot be used in conjunction with other promotions. Not applicable for Xmas/NY.